You said yes to the man or woman of your dreams and now it’s time to plan that jaw-dropping wedding celebration of all time. But before you go to Pinterest or to the stashed-away bridal magazines, there are a few things to consider and take care of before your wedding day. 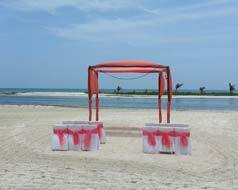 Once you’ve decided that a destination wedding is for you, the location should be the first decision you make. Yes, even before choosing the day you say “I do”. While there are many great out-of-state choices from which to chose, Hawaii, Costa Rica, Dominican Republic, Mexico, the Bahamas and Caribbean are some of the most popular. Some resorts are all-inclusive meaning that taxes, gratuities, food, non-motorized water sports, and well, practically almost everything is included in the resort price. No hidden fees for you or your guests! In some locations, you can also choose between adult only or family friendly resorts. Once your destination has been chosen, a local travel agent can get you in contact with a wedding coordinator. With the coordinator, you will decide on a day for the ceremony to take place. This should also happen fairly soon as many resorts limit the number of weddings they allow per day. The wedding coordinator then helps you take care of your wedding to-do list making it effortless and organized. They will give you a selection of optional choices to personalize your wedding, ranging from florists and photographers to dinner parties or receptions. You won’t miss a thing with their assistance! The Wedding Coordinator will inform you of the necessary documentation you will need to complete or bring to ensure your wedding is legalized. They will also let you know the regulations for the wedding to take place. This can be extremely helpful as some places require the bride and groom to be within the country at least 3 business days before the ceremony and may require a blood test. This is where a travel agent saves the day (besides connecting you with the wedding coordinator, of course). A travel agent will be able to take care of booking transportation and accommodation for all of your friends and family attending. No matter where they are from or how long they want to stay at the resort, a travel agent coordinates specifically with them to book their stay. Group discounts and special offers may also be given, so ask your travel agent what is available. First off, why not? This is an unforgettable way to celebrate one of the most important days in your life, not only for the bride and groom, but for the wedding party as well. Many details such as accommodations, transportation and entertainment bookings are taken care of by a travel agent and wedding coordinator. Resorts often times pamper the bride and groom with special amenities as well!